Stop #6 of the 2017 Burger Love tour. 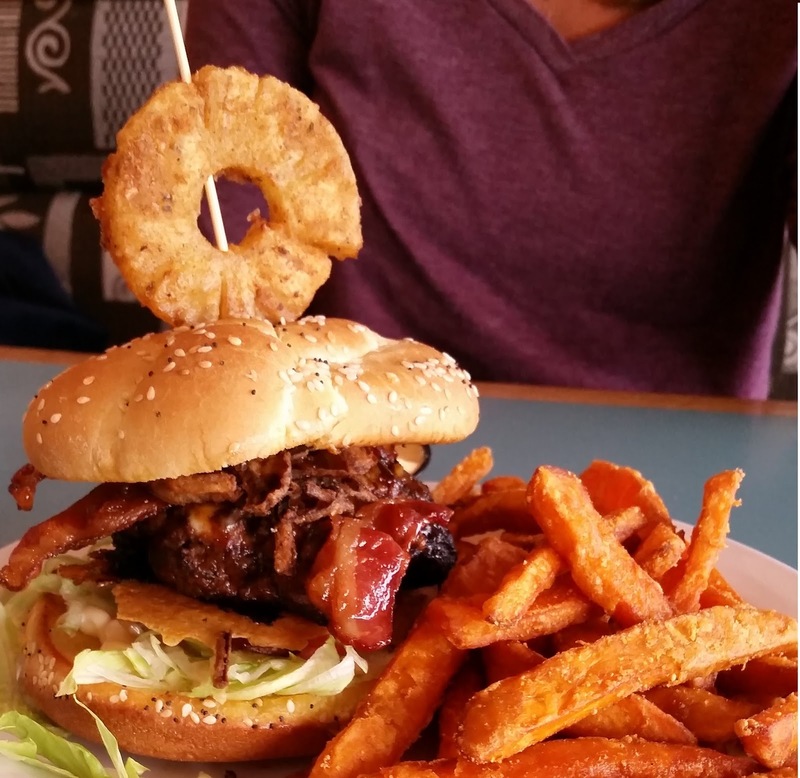 So after spending the past week in Cuba it only made sense that my first meal back on PEI was a Burger Love entry. Not wanting to have to go too far after being away all week we decided to try out the burger at Local 311 here in Summerside. The Elephant in the Room is 8 oz Island Beef Patty infused with Calabrese and Cheddar, house-made BBQ Sauce, Mayo, Candied Bacon, Lettuce, Tomato, Deep Fried Pickles, Deep Fried Onion Crisps, Monterey Jack Cheese Crisp on a grilled Kaiser Bun topped with a Deep Fried Pineapple Ring. It's a pretty neat looking burger. Since we were splitting the burger we decided to add sweet potato fries, the cajun flavoured mayo with the fries was great. Unfortunately, as I found out watching a recent episode of MasterChef, when you infuse a burger with cheese the odds of the burger being burnt dramatically increase and that was the case with the bottom of our burger. I'm not sure if they forgot to put the BBQ sauce on the burger or if they just used very little of it but I couldn't taste it so that was disappointing. The candied bacon was the champ of this entry, pretty tasty. Just couldn't get past the burnt burger taste in every bite.